Dr. Micozzi believes that optimizing your vitamin D levels is one of the single most important steps you can take to protect your health long-term. And now, getting more vitamin D in your diet is easier, and more enjoyable, than ever! With SmartScience Nutritionals’ new Core D3 Liquid Vitamin D.
Core D3 Liquid Vitamin D delivers 5,000 IU of vitamin D in an easy-to-use, citrus-flavored liquid. Just a few drops each day of this natural, “anti-aging” powerhouse can help boost longevity by supporting every working system in your body. So you can feel great well into your 50s, 60s, 70s, 80s, and beyond! In fact, in a new landmark study, men and women with higher blood levels of vitamin D lived longer. Plus, researchers uncovered a very strong “dose-response.” That means, the higher the participants’ vitamin D level, the longer they lived. On the other hand, the lower the vitamin D, the shorter their lives. This analysis involved almost 60,000 men and women garnered from 11 different studies. And it made one thing perfectly clear. Men and women with higher vitamin D levels live longer. Certain at-risk groups of adults appear even more vulnerable to deficiency. Including darker-skinned adults. Obese adults. Adults who take certain medications. And older adults. They found that a shocking 82 percent of one “at-risk” population had vitamin D deficiency! The Institute of Medicine says older adults are especially at risk to develop vitamin D deficiency. They probably need more vitamin D because of changes in their bodies as they age. Best of all vitamin D is free. Your body can produce it whenever you expose your skin to strong enough sunlight. Unfortunately, most of us don’t get enough vitamin D from sun exposure alone. Or even from our diets. Well, few foods naturally contain vitamin D. Plus, government and mainstream “experts” have made most of us afraid to spend even 60 seconds outside in the sun without sunscreen. So, your body never has the chance to convert this free sunshine into healthy vitamin D levels. Plus, even if you do spend a lot of time out in the sun. It doesn’t mean you’re safe from deficiency. On a regular summer day, say you spend 15 minutes outside in the sun at midday without sunscreen. Your body can produce 3,000 to 20,000 IU of vitamin D on its own. Depending on your skin tone. 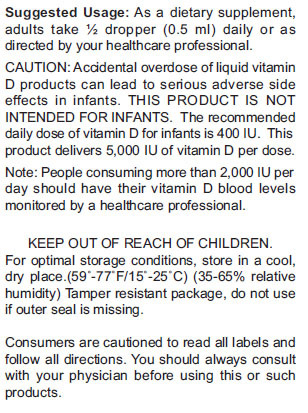 In one potent dose of Core D3 Liquid Vitamin D, you get 5,000 IU of vitamin D. That’s roughly the same as what a fair-skinned person might get sunbathing for 15 minutes. But from October to April in most parts of the country, you can’t generate this much vitamin D. Even if you spend all day in the sun. The sun never gets strong enough or high enough in the sky. In fact, at that time of year, the sun’s rays at latitudes north of Atlanta, Georgia, aren’t strong enough to activate or “turn on” your body’s own production of vitamin D.
With Dr. Micozzi’s Core D3 Liquid Vitamin D, you can help outsmart the problem. You’ll get a full 5,000 IU of vitamin D in just one half of a dropper of Core D3 Liquid Vitamin D.
With Core D3 Liquid Vitamin D, you’ll support your immune system. And boost your longevity. Because remember, research links higher vitamin D levels with a longer, healthier life. Dr. Micozzi’s Core D3 Liquid Vitamin D again sets the industry standard. It’s incredibly powerful. Easy to swallow. And it has a refreshing, citrus taste. Optimizing your vitamin D levels is the No. 1 single step you can take to improve your health long-term. 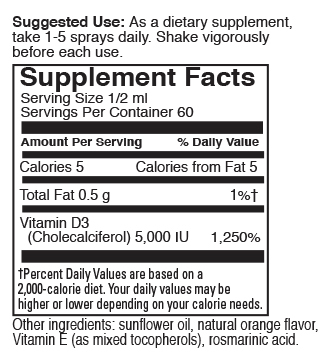 So order your risk-free supply of Core D3 Liquid Vitamin D today. Dr. Micozzi’s Smart Science Nutritionals formulas are all backed by a 100% Customer Satisfaction Guarantee! If you’re not completely satisfied, we’ll refund you 100% of your money, at any time (less shipping). Simply send us the unused portion of your order and we will issue a prompt and courteous refund, no questions asked.